Hola Flo! Beauty and Lifestyle Blog: Facial waters; yes or no? Facial waters; yes or no? I've been really enjoying using facial waters lately. Here in Argentina it gets really warm in summer and it's not uncommon to hang around with a little can of thermal water, at least my mom always had one but I didn't imagine I would be using them every single day regardless the weather. At the moment I only have three to talk about but as mentioned before, I've tried a few more and this is just the kind of product that won't let you down, unless it promises miracles. The first one I tried was the La Roche Posay Thermal Spring Water. What I love about LRP is that (at least in Argentina) they have good deals and usually if you buy a soap or some moisturizer you will probably get a small can of thermal water for free, so you always get to try another product. LRP Spring Thermal Water claims to provide powerful anti-oxidant protection as it contains a high concentration of the element Selenium, which contains antioxidant properties that prortect cells from damage. However, I've been reading a bit about Selenium and I've heard that it can increase the risk of non-melanoma cancer. Taken at normal doses, Selenium should't be dangerous but an overdose could cause bad breath, fever, nausea. liver, kidney, heart problems, diabetes and cancer. This obviously scare the shiaat out of me, specially cause LRP states that selenium concentration in this water is high. LRP Thermal Spring Water also promises to refresh, sooth and tone skin which I agree, it feels very nice on the skin and I'm sure it is safe to use it but I don't plan to repurchase it. Talking about Thermal Spring Waters I've also tried the Avene Thermal Spring Water and god, it sprays like heaven covering the entire surface of my skin unlikely the LRP and Lush ones. Avene is a brand that is focused on sensitive skin and even if my skin is not that sensitive I do get ezcemas, breakouts and redness. It claims to treat psoriasis, ezcemas, redness, dermatitis and other skin conditions. It's recommended for after exercise/cleasing/shaving/waxing to set makeup and for sunburn. What I can say about it is that it really works. 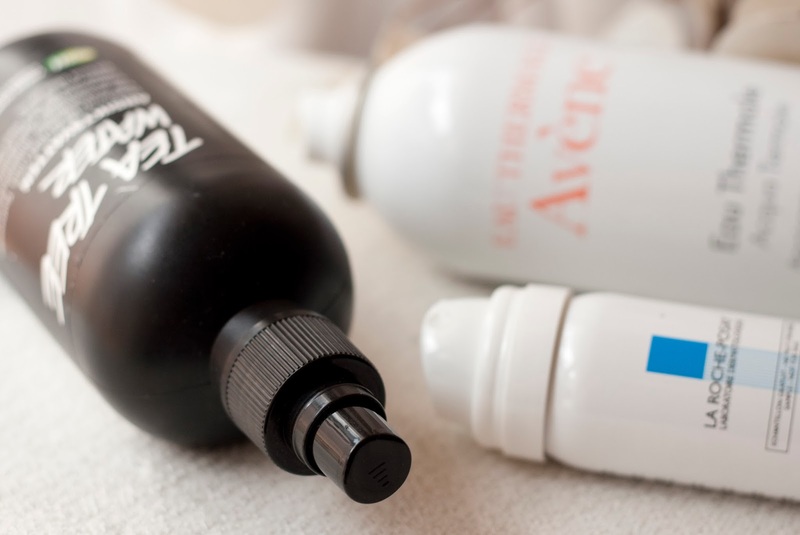 Do not expect to get rid of your acne with a thermal water cause it won't probably happen. I apply this thermal water twice day everytime I wash my face with soap and since I started to use it I feel my skin way more hydrated and soft. Before and after make up I use the Lush Tea Tree Water (full review here) and I love it, it contains tea tree water that helps clearing out blemishes, balancing and clarifying skin tone. It's alcohol-free and also contains Juniperberry water that helps eliminate toxins and Grapefruit water that is used to enliven the senses and bring necessary minerals to the skin. It is recommended for oily, dull, tired and spotty skin but I'm sure this would work great on any skin tone. This is a bit more intense that the waters previously mentioned and I think it's because of the tea tree water in it. It's also important to mention that this tea tree water won't reduce redness or calm irritated skin, it was actually a bit itchy the first time I used it. It's hard to pick only one cause both have different ingredients and uses but I can say they compliment eachother pretty well and they have become a very important part on my skincare routine. Las aguas en spray no son algo que pensé que agregaría a mi rutina de cuidados de la piel. Acá que hace bastante calor en verano suelo ver mujeres con sus latitas en la cartera, de hecho mi mamá siempre tenía una pero no imaginé que yo terminaría usándolas diaramente sin importar el clima. Por ahora voy a hablar unicamente de estas tres, pero como dije antes, probé más de otras marcas y con todas siempre llegué a la misma conclusión: no decepcionan. El primero que probé fue el agua termal Thermal Spring Water de La Roche Posay. Lo que más me gusta de LRP es que siempre están estas promos de si comprás un jabón o crema te viene con un agua termal y así es como la probé. El agua termal de LRP dice proveer una poderosa protección anti-oxidante ya que contiene una alta concentración de el elemento Selenium. Estuve leyendo sobre los beneficios de este elemento y vi que usado en altas cantidades puede incrementar el riesgo de cancer non-melanoma. En cantidades normales no debería causar ningún tipo de daño pero una sobredosis podría causar mal aliento, fiebre, nauseas, problemas en el hígado, riñón, corazón, diabetes, y anteriormente dicho, cáncer. Esto obviamente me dio un susto importate, especialmente ya que LRP dice que tiene una alta concentración de Selenium. Esta agua también promete refrescar y tonificar la piel con lo cual estoy de acuerdo. Se siente bien en la piel y estoy segura es segura de usar pero no pienso volver a comprarla. 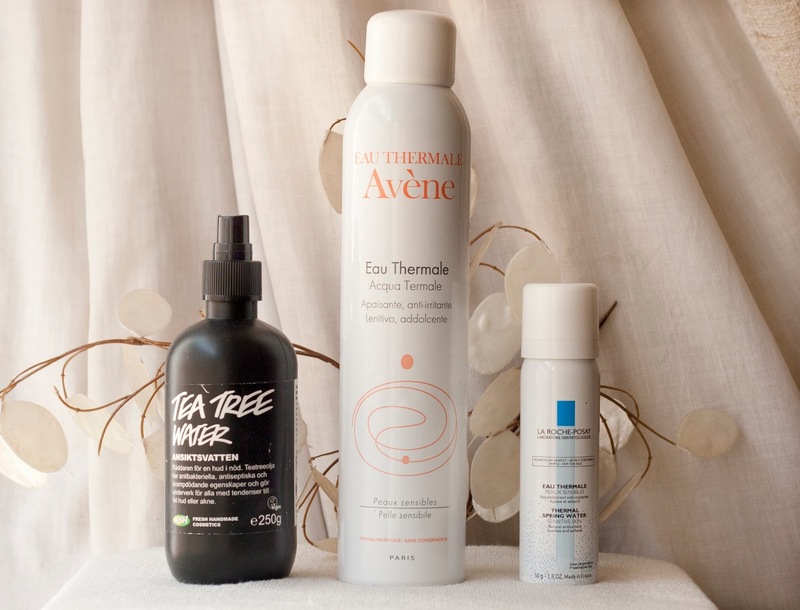 Hablando de otras Thermal spring waters que usé también está la de Avene que dios, tiene un spray que alcanza toda la superficie de la cara y la primera vez que la usé fue una sensación muy linda. Avene es una marca enfocada en las pieles sensibles esta agua dice tratar problemas de psoriasis, ezcemas, rosacea y dermatitis. Está recomendada para después de hacer ejericio, afeitarse, depilarse, maquillaje y tomar sol. Para mi funciona. No esperen que les elimine el acné ni que les cambie el tipo de piel porque eso no va a pasar. Uso esta agua terminal dos veces al día después de lavarme la cara con jabón en gel y desde el primer usó noté mi piel más suave e hidratada. Antes de ponerme maquillaje y después de sacarmelo uso el Tea Tree Water de Lush que contiene aguá de arbol de té que ayuda a tratar los granitos, clarificar y balancear la piel. Es alcohol-free y también contiene enebro que es un estimulante y descongestionante de poros y agua de pomelo que es un desintoxicante natural. Esta agua/tónico está recomendada para pieles oleosas y cansadas pero pienso que va bien para cualquier tipo de piel. Es un poco más intensa que el agua de Avene y LRP ya que contiene el agua de árbol de té y es importante mencionar que en mi caso no me redujo la irritación de la piel, de hecho me ardió las primeras veces que la usé ya que en ese entonces tenía la piel bastante sensible. Es dificil elegir sola una ya que tienen diferentes ingredientes pero me quedo con la de Avene y Lush porque se complementan muy bien. Ustedes usan algún tipo de agua diariamente? I have the Avene thermal water and I love it! I really love facial waters. Lush and Caudalie are my favourite brands. But I do like to keep Avene thermal water when I'm on a hot vacation. Nothing cools me down better! I use the Avene one, but only in summertime, otherwise I don't feel the need to do it. Well, I'm using Serozinc from LRP, but that doesn't really count as face water, does it :)? He probado el agua theraml de Avene y me gusta mucho. Yo tengo la de avene, y me encanta!! Hola Flor! Yo no uso ninguna :( y ahora esta super frio por aqui y ando con toneladas de crema hidratante :( :( pero me ha encantado el post! Quiero probar una en el verano!